A few springs ago I purchased five faux paperwhite bulbs from Magnolia Market. 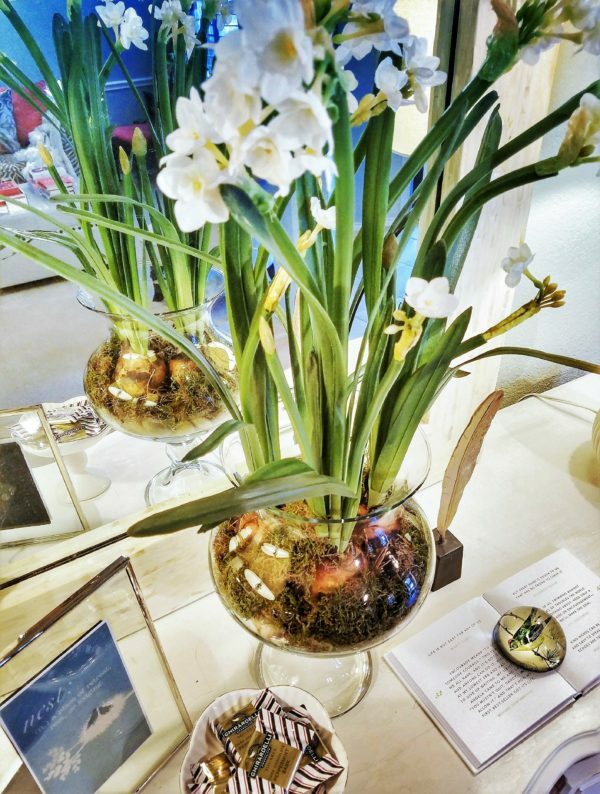 Real paperwhites are a fragrant winter-blooming bulb typically grown indoors. I liked the faux option because they would last me until spring when I change over my decor to Easter. And, I can tuck them away in a storage box for the next year. I wanted to show you that with just a few simple supplies you can create your own paperwhite centerpiece. First, you need an adorable kitten to supervise the process. 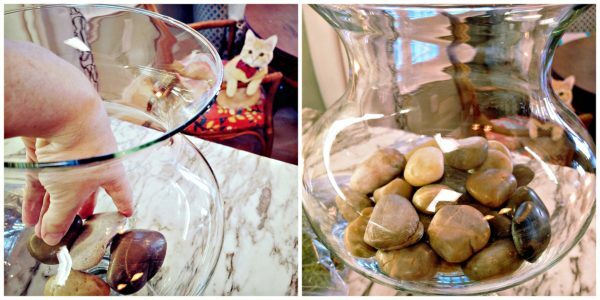 Then, you need a glass vase so you can see the rocks, moss and roots of the bulbs. I purchased five bulbs (Magnolia Market still offers them here). You could do this project easily with just three bulbs (remember in nature most things grow in threes and fives). First, put in a layer of river rock. You can either use rocks you’ve collected or most craft stores sell bags of rocks. I think I used about 20 rocks, but if you use a smaller vase you can decrease the number of rocks. Then take green floral moss, again from the craft store, and place a nice layer on top of the rocks. 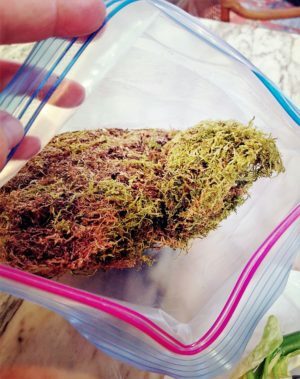 I keep a few bags of moss on-hand in a ziplock bag in my floral box in the attic. Last, start nestling the paperwhite bulbs down into the moss trying to fit them snug into the rocks so they will stay standing up. Don’t they look real? 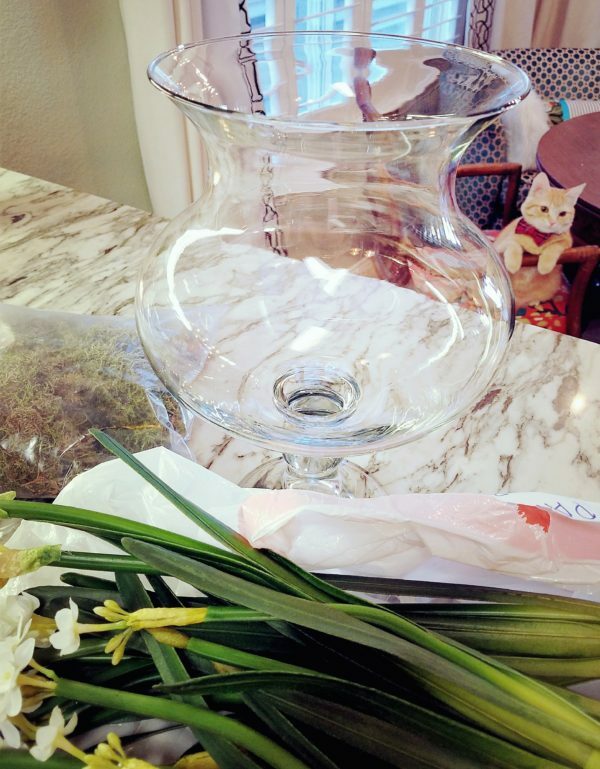 I had five total bulbs, but I could only fit four into the vase (that’s okay, I put the remaining single bulb into a smaller square glass vase). You may have to move the moss and rocks around to get it all to fit. 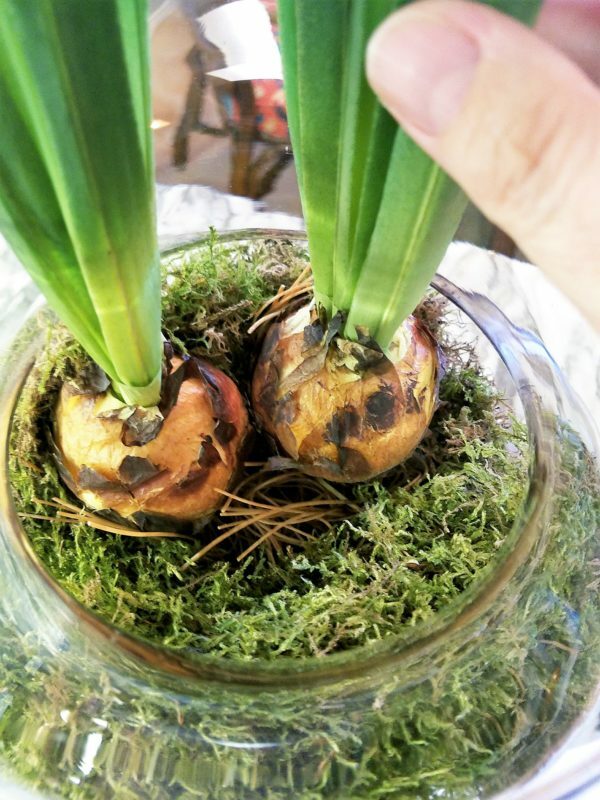 Be sure if your bulbs have roots to make those peak through the moss. There you go! 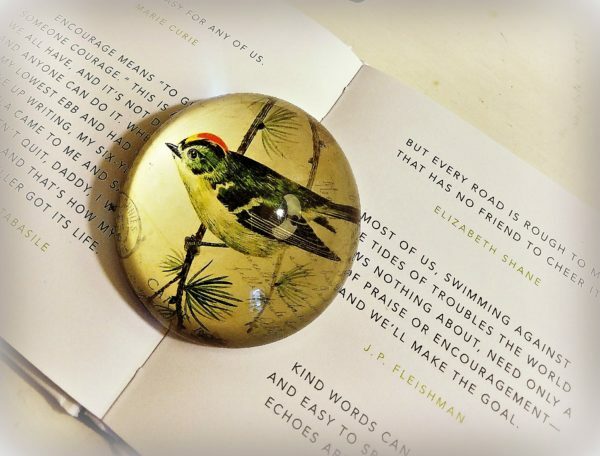 I placed the centerpiece on the entry table with just a few other pretties like a dish of chocolate and a book of quotes with Mother’s paper weight placed on top of the pages to keep the book open. A fun decorating trick. 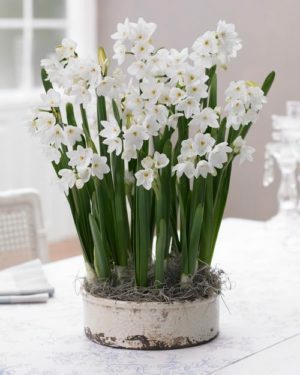 Paperwhites are the perfect flower to hint that spring will soon arrive!